For those not necessarily in the know about European basketball, the announcement of Anthony Parker’s retirement from professional hoops today may not have exactly made most sit up and take notice – just another Cleveland Cavalier gone, right? 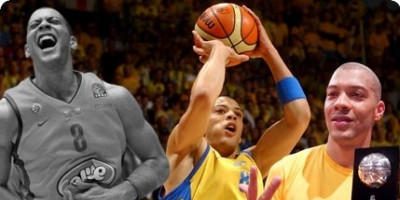 Except that Parker’s six-year European CV is loaded with team accomplishments and individual accolades, bringing Maccabi Tel Aviv a superpower’s worth of trophies in the mid-2000s. His brief run earned him a spot on the “50 Greatest Euroleague Contributors” list in ’08 – just one of 35 players and one of five Americans – after racking up consecutive EL MVP awards, one EL Final Four nod and three European rings (two EL, the other the 2001 FIBA SuproLeague title). Parker began his professional career after finishing his four years at Bradley University; he was selected at no. 21 of the 1997 NBA Draft’s first round by the New Jersey Nets and dealt to the Philadelphia 76ers. After suffering various injuries for his first few years, the Sixers swapped him to the Orlando Magic for 1999-2000. A release from that team led to a stint with the Quad City Thunder (!) before Parker made the fateful decision to shift gears on his career. Despite being “young and scared and loath to leave his apartment” in Tel Aviv in 2000-01, Parker found the then-wide open European game – and Pini Gershon’s willingness to give the American plenty of playing time – much to his benefit. Parker resurrected the double-digit scoring fast-break leader persona he’d worn at Bradley. After helping Maccabi take the 2001 SuproLeague title, Parker entered full-on unified Euroleague play for 2001-02 and compiled a line of 16.4 points, 5.2 rebounds and 1.5 steals per game. Playing a season for Lottomatica Roma, he returned to Tel Aviv for 2003-04 and 2004-05, and his scoring numbers further increased to 16.0 and 18.0 ppg, respectively, in those years as the Israeli side bagged back-to-back titles in the big league; in the latter season, Parker got his assist and steal marks up to 3.5 and 2.0 per game, respectively. These efforts were good enough to land Parker his two MVPs. If Parker so chose, everything was in place for a triumphant return to the NBA. He did and it was. In his inaugural season with the Toronto Raptors, the Canadian side benefitted from the lessons Parker’d learned in Europe. The Raps went 47-35 in 2006-07, the club’s best mark ever. Unfortunately, the team flamed out in the first round of the NBA Eastern Conference playoffs that year. To get any closer to the lofty heights of the NBA finals, Parker would have to join the Cleveland Cavaliers. Getting with Lebron’s squad the year after Cleveland had taken the East, Parker started 81 games and contributed a 7.3 ppg scoring average in 2009-10 including a nice 41.4% on threes. After this, of course, King James departed and the Cavaliers sunk back into the obscurity they’ve “enjoyed” since the early 1990s. Parker wound down a career, but not before he’d hit one very important three (locally) in his second year with Cleveland. In leaving the game behind, Parker stated that he was “at peace with [the decision to retire] and excited for whatever the future has for me.” BiE wishes him much luck and may his future be as bright as his past.